Facelifted Proton Saga waiting to be unveiled at the 2010 Thailand International Motor Expo! 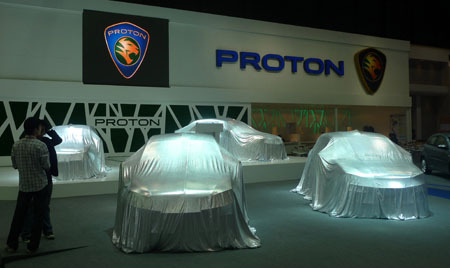 Home » Local News » Facelifted Proton Saga waiting to be unveiled at the 2010 Thailand International Motor Expo! We’re reporting to you live from the Thailand International Motor Expo 2010 in Bangkok. There will some cars of interest to us that will come your way later, but the biggest news without doubt will be the world debut of the facelifted Proton Saga. For now, we know that the refreshed Saga has some major changes in the sheetmetal and added features in and out. We don’t have any information on if there’s any technical changes in the engine bay at this moment. We are also looking forward to see the progress on Honda’s New Small Concept, whether it’s a close to production “concept” or the full production model. The facelifted Honda Accord is also slated for its Thai launch here. We will be back shortly with information, images and a video from the Saga launch, which will happen around lunch time, so make sure your browser is locked on to this website!